WASHINGTON (Reuters) - The choice of Vietnam as the venue for a second U.S.-North Korea summit this month shows the possibility of moving beyond conflict and division toward a thriving partnership, the U.S. State Department said on Thursday. These included complete denuclearization, transformation of U.S.-North Korea relations and building a lasting peace mechanism on the Korean Peninsula, he said. Palladino reiterated that sanctions relief that North Korea has been seeking would follow its denuclearization. He said U.S.-Vietnamese history "reflects the possibility for peace and prosperity." "We moved past conflict and division towards the thriving partnership we enjoy today," Palladino said. He gave no other details on Biegun's talks in Pyongyang and declined to say how long he would stay there. The State Department said earlier in the week that Biegun would travel to Pyongyang for talks with his North Korean counterpart Kim Hyok Chol on Wednesday, but has not commented further. Biegun said last week his Pyongyang talks would be aimed at mapping out "a set of concrete deliverables" for the second summit. He said Washington was willing to discuss "many actions" to improve ties and entice Pyongyang to give up its nuclear weapons and that Trump was ready to end the 1950-53 Korean War, which concluded with an armistice, not a peace treaty. 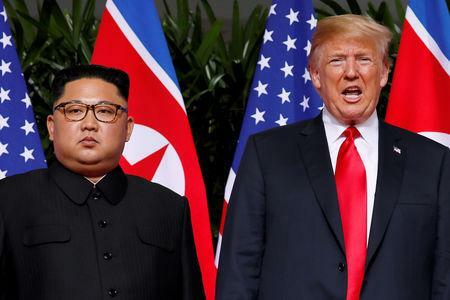 While Trump has hailed "tremendous progress" in his dealings with North Korea, a confidential report by U.N. sanctions monitors seen by Reuters this week cast further doubt on North Korea's intentions. It said the country's nuclear and ballistic missile programs remained intact and North Korea was working to make sure those capabilities could not be destroyed by any military strikes.